Cornish game hens are not only unique for a dinner party or date night entrée but inexpensive as well. One hen will serve two people and they usually come in a package of two hens that can be individually thawed. If you do not have fresh cherries, replace with the frozen version and thaw. Serve with long grain wild rice for a wonderful meal. A Blood Orange Infused Olive Oil by is being used and can be purchased on-line at Spicewood Food Company. Ingredient amounts will serve two. Adjust amounts to accommodate the number of people serving. Rinse hens and remove anything inside the cavity. Season hen with salt and pepper. Add 2 tablespoons of Blood Orange Oil to a large sauce pan and sear hen on all sides 5 minutes for top and bottom and 3 minutes for sides. Preheat oven to 375 degrees and place in a baking dish with 2 tablespoons of Blood Orange Olive Oil. Bake for 45 minutes or until done, no pink should remain in the middle. Tent with foil and let rest for 10 minutes before cutting in half. While hen is baking make sauce. Using the same pan that the hens were seared in, sauté the shallots over medium high heat for about 1 – 2 minutes. There should be enough oil in the pan, but add more if needed. Add the port and deglaze the pan. Add the broth and cherries and bring to a boil. Reduce by about half. Make a thickening agent of cornstarch and water. Gradually whisk in thickening agent to boiling sauce a little at a time to desired thickness. Sauce will not thicken until brought to a full boil. 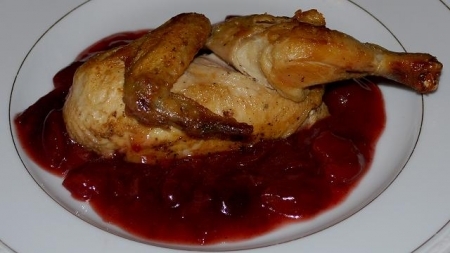 Plate by cutting hen in half, add sauce to bottom of plate and top with half of the hen. Serve additional sauce on the side. A Claret would be great and bring out the cherries in the sauce, try Becker Vineyards Claret (Texas) or Francis Coppola Black Label Claret. Or try Becker Vineyards Prairie Rotie Texas High Plains Red Table Wine, which is what we paired with this meal. Becker Vineyards wine can be purchased in some stores and online at www.beckervineyards.com. Can you make the sauce a day ahead?